Expozine: D+Q in Montreal this weekend! That's right, it's time for Montreal's best small press fair of the year. Buckle your seatbelts and get ready for Expozine 2012. 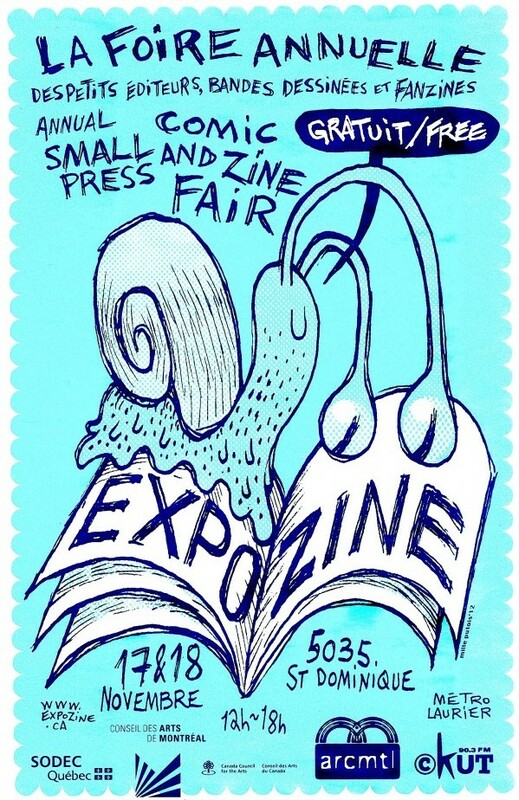 This year's exhibitor list is especially impressive, and I'm always excited to see a new crop of sure-to-be-awesome exhibitors alongside old pals (and former coworkers) like Jamie Q, Conundrum Press, and Julie Doucet! Find us in the basement of the Église Saint-Enfant Jésus (5035 Saint-Dominique, a few steps away from Saint-Joseph and Saint-Laurent) from 12 pm to 6 pm Saturday and Sunday. We'll have a limited selection of signed stock by Adrian Tomine and Anouk Ricard, in case you missed their awesome events this week. Finally, we're hosting our annual Expozine kick-off party with a round table discussion and screening of some scenes from Cartoon College at the Librairie tonight. Submitted by dq_admin on Friday, November 16, 2012 - 3:00pm.